Kea Lani Maui, Hawaii. Book at American Sky today. Nestled along the Wailea coast and tucked away on the sugary white sands of Polo Beach, this luxury resort offers a vibrant and enticing taste of the laidback Hawaiian lifestyle. Three swimming pools, four mouth-watering restaurants and an award-winning spa, make this an excellent choice for couples seeking a luxurious retreat. 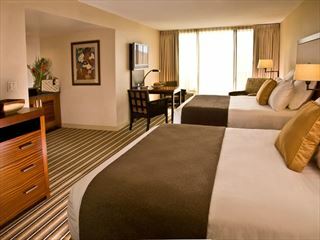 The rooms and suites are modern and inviting, with amazing vistas adding to the charm. 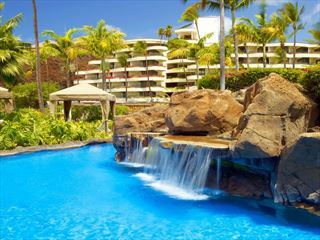 Beautifully located on the Wailea coast on the stunning white sands of Polo Beach, this luxurious resort and spa offers an authentic Hawaiian experience in a spectacular setting. Ko - The hotel's signature restaurant, serving up Plantation inspired cuisine and mixing an array of cultures including Hawaiian, Filipino and Japanese. Nick's Fishmarket Maui - This is one of the island's premier seafood restaurants, serving only the freshest of fish including Live Keahole Maine Lobster. Luana - Sneak a contemporary taste of Hawaii at the fun venue, with zingy cocktails and cool music alongside amazing sunset views. Ama Bar & Grill - A laidback bar and grill right by one of the pools, inspired by Hawaii's canoe lifestyle and offering a snazzy swim-up bar. Cafe Ciao Bakery and Market - A lovely cafe offering hot and cold drinks alongside sandwiches and salads. Just Juice - Treat yourself to a refreshing juice created with Maui's ripest fruits and veggies.